I spent the day with my son at his middle school a few weeks back. The school has a great program which encourages dads to participate. The experience, for me at least, was very eye opening. I was amazed and impressed by my son’s ability to adapt, organize and manage himself under circumstances that even most adults would find stressful and uncomfortable at best. He is a great student and a pretty awesome kid. I am so very proud of what I observed in him. I would also like to thank the teachers for their continued efforts to help children sometimes with the support of their environment and sometimes in spite of it. I should explain the picture above. This is an actual poster I saw on the wall at my son’s school. I assume it was created by a well-meaning teacher who was simply trying to create relevancy between the Standardized Test (SOLs) and teenage pop culture to encourage children’s interest. If you aren’t able to identify the picture, it is of a scene from the movie “The Hunger Games” which is about people betting on children and young adults who fight and kill each other to win government support for their districts. Perhaps the picture is a bit more relevant than the teacher realized. 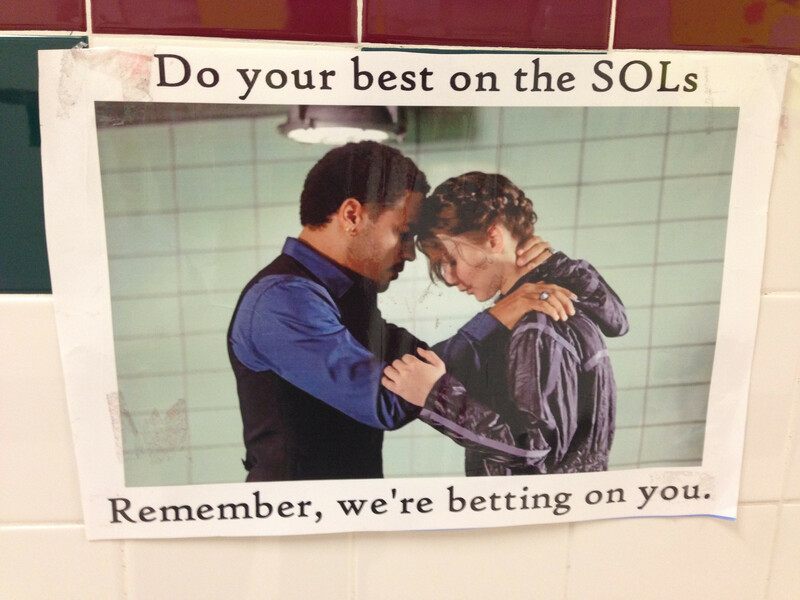 There were all sorts of posters highlighting the critical importance of the SOLs. Most of them much more benign than this one. I didn’t notice any other art on the walls. 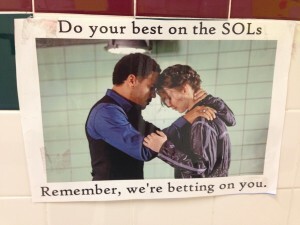 I don’t mean to say that this poster represents the entire school environment, but it is indicative of the larger issue. Speaking of the environment, here’s how I would describe it: Cold, sterile, cinder block and tile hallways, hard, metal desks and plastic chairs, loud, rushed, crowded, not much natural light, lots of corners, edges, straight lines and nothing soft or comfortable in the whole place (except for the beautiful courtyard which seems to be used by about 8 of the 600 students in the entire school). It is not a welcoming, homey place where children would otherwise want to be. This is an environment that doesn’t match anyone’s idea of comfort, order and calm. Consequently, it forces teachers and children to work against it more often than they can rely on it. No one would live here willingly, and yet that’s essentially what our teachers and children do. They spend most of their lives there! In spite of the fact that this school building is only 15 years old it’s basically the same as the school I attended built in 1961. Less natural wood, though. However, aside from the physical environment, which isn’t likely to change much without a complete overhaul in how we view children and education, there seems to be one thing we could do to support the needs of our students AND teachers. We could ensure that all of our teachers are trained, understand and practice a unified method. In sixth grade, my son has 4 classes each day. Each teacher is completely different from the next. What varied the most was the teacher/child interactions I observed. I saw the full gamut; from the teacher aide with 15 years of experience yelling at the top of her lungs “EVERYONE IN YOUR SEATS NOW. EYES FRONT! ONE. TWO. THREE!” to the teacher who respectfully had her students pass a talking ball around as they engaged in a lively debate on military conscription. I saw lots of information being transferred, or at least the attempt to do so was evident. There was no shortage of devotion in the teachers who clearly had the best intentions and a desire to help each child grow. I saw children engaged and I saw children bored. I saw the same thing from teachers as well. I also saw children respected and supported and I saw children shamed, rushed and disappointed. The one thing I didn’t see was a consistent understanding on the teachers behalf that he/she is not simply the purveyor of content, but rather the dynamic link between the lesson and the child. Yes, that’s a Montessori concept, but the idea applies to children regardless of the program itself. It seemed to me that many of the teachers clearly understood the outcomes desired by the County education system, but how the students get there (or don’t get there) is almost entirely up to the teacher’s individual technique. This seems as difficult for the teachers as it does for the students. If teachers are first trained in a philosophy and technique which respects the child, requires the teacher to reflect on herself first, to be patient and learn through observation, to relinquish some control over the environment to the students, to know that things like patience, executive functioning, empathy, generosity should be taught along with academics, to encourage social interaction and collaboration and to follow the child (and they are given the time and respect themselves to hone their craft) the rest will fall into place. Children will learn because of the method rather than rote memorization of content, which isn’t really learning at all. This cannot be accomplished by new and improved software, hardware, text books or standardized tests. Dr. Montessori said of a worthwhile, child-centered education “…A teacher must prepare herself not by means of the content, but by means of the method.” Everyone; teachers, students, administration, parents, the entire nation is looking for change. Right now it seems that our public school system is all content and no method. Until that changes, nothing else will.